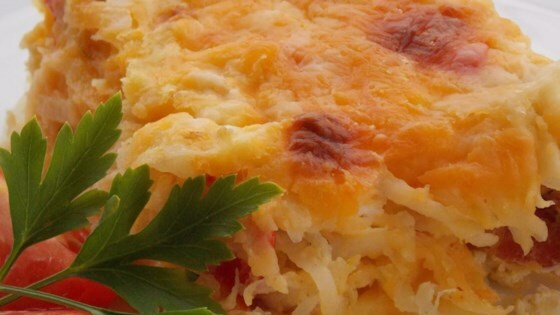 "A hearty bacon, egg, and hash brown casserole for the bacon lover in all of us. Feel free to use turkey bacon rather than pork!" Place bacon in a large skillet and cook over medium-high heat, turning occasionally, until evenly browned, about 10 minutes. Drain bacon slices on paper towels; reserving 2 tablespoons drippings in the skillet. Crumble bacon and set aside. Cook and stir onion and bell pepper over medium heat in reserved drippings until tender, about 5 minutes; remove with slotted spoon. Whisk eggs and milk in a large bowl. Fold hash browns, Cheddar cheese, salt, pepper, dill, onion mixture, and crumbled bacon into egg mixture; transfer to prepared baking dish. Bake in preheated oven until a knife inserted near the center comes out clean, 35 to 45 minutes. This hearty casserole is a hit at the holidays, or any time. Took longer than 15 min. to prepare. Took longer than 50 min to fully cook. Great casserole! Easy to throw together with simple ingredients. Great ratio of bacon, egg and cheese. Thankful for a breakfast casserole without a bread base. Followed the recipe exactly except used country style potatoes instead of hash browns and it was really good. I will be making this again. Love this recipe as is. I've even made it the night before, covered with plastic wrap and popped it in the fridge. Then in the morning its ready for the oven. Great brunch dish!